Gynecomastia, a condition characterized by enlarged male breasts, can be mild or moderate, and it can be easily addressed with gynecomastia surgery to reduce the breasts and create more defined chest contours. Excess breast tissue and fat on a male can be unflattering and embarrassing. 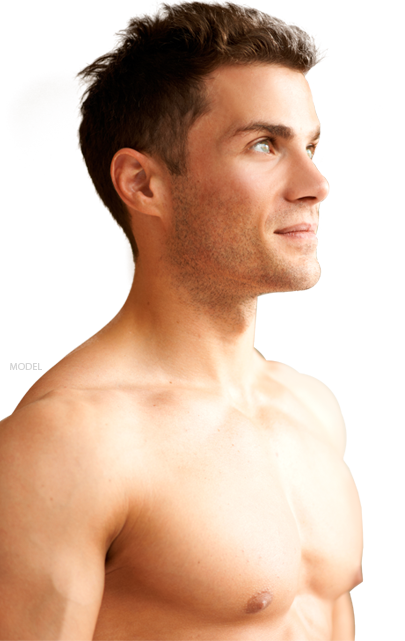 This condition is known as gynecomastia and is a very common problem among men of all ages. The majority of men develop atypical breast tissue during adolescence. Excess fat and tissue in the chest area tend to naturally go away after puberty, although sometimes it doesn’t and leads to lasting breast development. Men suffering from gynecomastia may have enlarged male breasts for different reasons, such as from medications or drug use. Male breast reduction surgery, or gynecomastia surgery, is an ideal procedure for reducing fat and glandular tissue while providing more smooth and masculine chest contours. A personally tailored procedure is designed for each patient based on his severity of fat, tissue, and skin. What causes gynecomastia to develop? There are many causes of gynecomastia. Some men have idiopathic (unknown) development. Other men’s bodies have increased estrogen, which can be caused by many factors, such as steroid use, obesity, kidney failure, or rare tumors. Long-term use of certain medications and drugs can affect a man’s breast growth. Who is the best candidate for gynecomastia surgery? Men who have an accumulation of fat and glandular tissue in the breast area may be interested in gynecomastia surgery. A good candidate for male breast reduction surgery has tried alternative methods to reduce his breast size and has been unsuccessful. Patients should be non-smokers, in good health, and at a normal body weight. It is best if potential patients have stabilized breast development and realistic expectations. After surgery, a dressing will be placed over the breast area to ease swelling and to secure the new chest contours. To alleviate any pain or discomfort and to aid in healing, medications will be prescribed. Most patients take five to seven days off work from sedentary jobs. Patients should avoid physical activity, especially any movement involving the arms or upper body, until they receive clearance from Dr. Nelson. Depending on the technique utilized, the location of surgical scars will vary. Typically, incisions will be made in discreet locations and should fade over time. Gynecomastia surgery is designed to provide long-lasting results. However, the outcome of the surgery can be affected by weight fluctuations, medications, and aging. With a proper diet and exercise, patients will be able to maintain stable results.